Expresso the Ostrich, as he appears in Donkey Kong Country. Expresso the Ostrich is an Animal Friend in the Donkey Kong franchise, who first appeared in Donkey Kong Country as one of four ridable friends (along with Rambi the Rhino, Enguarde the Swordfish and Winky the Frog) and also as one of two who are birds (along with Squawks the Parrot). In Donkey Kong Country, Expresso can run at fast speeds and glide through the air by flapping his wings, but he has no offensive capabilities and has no way to defend himself against threats; some small enemies may pass under his legs, however, leaving him unharmed. Expresso reappears in Donkey Kong Country's semi-sequel Donkey Kong Land. He is one of the game's two Animal Friends, the other being Rambi. In this game, Expresso's abilities remain largely the same as before, except he can defeat enemies by jumping on them. He can even defeat Zingers. Expresso reappears in the Game Boy Advance remake of Donkey Kong Country 2: Diddy's Kong Quest. Expresso is apparently bought by Cranky Kong who uses the "vast fortune" he has made from his "starring role" in the game Donkey Kong Country. Cranky has planned on raising Expresso as a racing bird; unfortunately for Cranky, Expresso is extremely small and weak. Expresso can be found, along with Cranky, at Cranky's Hut. In order to make Expresso big and strong, Cranky tells both Diddy and Dixie Kong to find various Golden Feathers scattered throughout the levels of Donkey Kong Country 2. Each feather given to Expresso raises one of his stats, and makes him larger. 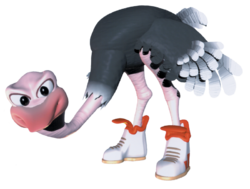 After becoming big and powerful, Expresso can be raced against other Ostriches in a minigame known as Expresso Racing; if Expresso wins a race, he obtains a trophy. If Diddy, Dixie, and Expresso gain all the trophies in the game, they can give them to Cranky to receive a DK Coin and a picture of Expresso for Wrinkly's Scrapbook. In the German Club Nintendo magazine comic "Donkey Kong in: Banana Day 24", Diddy and Dixie Kong are briefly seen riding Expresso to an airport. In the Donkey Kong Adventure story of Mario + Rabbids Kingdom Battle, Expresso makes a cameo appearance as one of Rabbid Cranky's Boombow weapons, the Expresso Atomizer. The weapon is described as officially licensed Expresso the Ostrich merch. The description also mentions that it has double kneecaps for authenticity, referencing how bird legs are composed of two intermediary articulations, although they only have one kneecap for each leg. Expresso appears as a spirit in Super Smash Bros. Ultimate. SNES Donkey Kong Country An ostrich friend with sneakers on both feet. Riding Expresso allows for high-speed dashing. As an ostrich, Expresso can't fly, but rapid button pressing can put extra distance on his jumps. This can be used to help Donkey Kong reach distant places. NA: His name is no joke–this bird is fast! Despite his size, Expresso is light as a feather and loves to glide through the air. In fact, he was too light to hurt enemies at first! He got a little stronger in Donkey Kong Land, and now jumping on foes is a piece of cake! PAL: Just as fast as his name implies! Expresso can't fly, but his running and jumping make up for it. Try not to step on any enemies, though, or he'll get hurt! Unless you're playing the Game Boy title Donkey Kong Land, that is. If you are, he can stomp on fiendish foes to his heart's content! Expresso and a large Expresso token. Expresso holds the letter "N" in Donkey Kong Country (GBC). Expresso in the canceled Donkey Kong Racing. The name "Expresso" is a combination of the words espresso (a coffee drink) and express (meaning "fast"). Multiple Expresso appeared in the trailer for the canceled game Donkey Kong Racing. Expresso can be found in the course Jinxy's Dunes in the game Banjo-Pilot. Cranky Kong references Expresso in the Donkey Kong Country 2: Diddy's Kong Quest instruction manual by saying, "A more tragic looking bunch of useless no-hopers you'll never see! I liked Expresso and Winky--where have they gone?," as well as in the Donkey Kong 64 instruction manual with, "I just hope they've included poor old Winky and Expresso this time instead of that bone-brained rhino that always seems to get in the games." Although he never appeared in the original game, official artwork of his Monkey Museum included in the manual of Donkey Kong Country 2: Diddy's Kong Quest also includes Expresso in place of Winky. When Expresso touches an enemy or gets touched by an enemy, his scream is the same as when Mini-Neckies are defeated in the SNES version of Donkey Kong Country. A street name in New Donk City (from Super Mario Odyssey) is "Expresso Street". Additionally, one of the store signs on the side of the buildings reads "Expresso Espresso".